Each product has been formulated by the brand’s in-house chemist to specifically address sensitive skin. Suitable for a variety of skin types including infant, elderly and problem skin, Dr V products are made with botanical extracts and essential oils and are free from harsh chemicals. The range includes body washes, body lotions, a hand and nail cream, and a leg and foot cream, all made with healing ingredients including Manuka honey, argan and avocado oils, and goats milk. 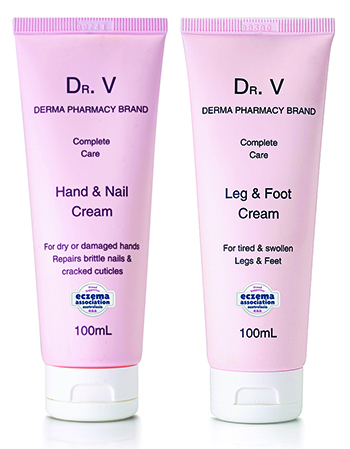 Dr V sits under the G&M Cosmetics umbrella, a family-owned company that makes all of its products in Australia. All G&M Cosmetics products are developed and tested by the company’s in-house technical team and chemist. Dr V skincare products are free from parabens, petrochemicals, formaldehyde, sulphates, phthalates, synthetic fragrances, and artificial colours. The entire range is Australian-made.